Here's an easy and delicious alternative to pumpkin pie that would be perfect to serve for your Thanksgiving dessert. It's a Paula Deen recipe, brought to my attention by my friend Mary Lynn. It couldn't be simpler to make and it's a great thing to make while your oven is busy with entrees and side dishes and such. 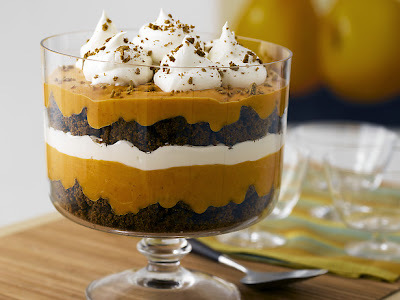 The first thing I noticed about this recipe is that it calls for pumpkin pie FILLING as opposed to solid pack pumpkin. No, they're not the same thing. But if you bought the wrong thing, or if you already have solid pack pumpkin, you can still use it. You just have to add sugar and spices to your canned pumpkin. Typically, it's pumpkin pie spice (cinnamon, nutmeg, ginger, cloves, and sometimes allspice) and sugar that are added to canned pumpkin to make it "filling". So, just add about 1/2 cup sugar and about 1 1/2 tsp pumpkin pie spice, then proceed with the recipe as directed. If gingerbread isn't your favorite thing, try using a pound cake instead! This is the perfect recipe to make the day before Thanksgiving. To save extra time, use instant pudding instead of the cook and serve, and use store bought gingerbread instead of baking it yourself. Yes, yes, I know I usually encourage making everything from scratch, but in this case, your time is a precious commodity and I promise I won't tell your guests if you won't!